Did your kids go back to school already? My girls did about 3 weeks ago. I set up a cute table the night before their first day of school. The girls were SO surprised when they woke up! Big smiles all around! I found most of the school supplies at Target, Walmart and the sandwich boxes at Jo-Ann Fabric and Crafts Store. My friends over at Anders Ruff designed a Hello Kitty inspired “Back to school” banner……isn’t this adorable? I made pancakes with strawberries and bought hello kitty yogurt at Walmart. The pretty sign is from Anders Ruff as well. It isn’t a party if there’s no cupcakes right? Dress it up with cupcake topper from Anders Ruff and hello kitty wrappers from Birthday Express. My girls love sixlets! I suggest getting sixlets from Sweetworks…..they have the best selection if you want something specific to match a party theme. I put sixlets in little cupcake wrappers with a topper on each one. Each of my girls got all this fun stuff to get them started for a fun day at school! The coloring books were found at Jo-Ann Fabric and Craft Store. The Crayola play pack is from Target and the Pez is from Walmart. I scored the Hello Kitty back packs on clearance for $10 at TJ Maxx! And this is the end my friends! It was all under $100, but the memories for my girls are priceless right? 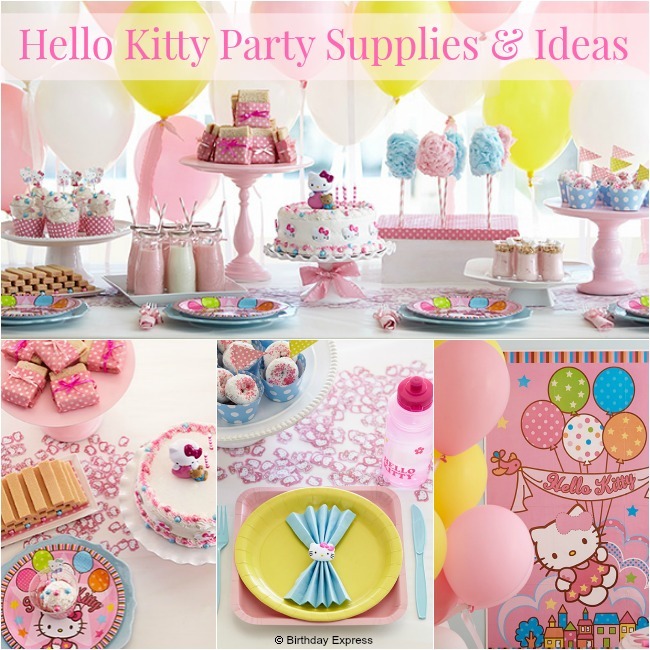 Check out Birthday Express for all sorts of fun and cute Hello Kitty party supplies! Party for less and save up to 80% off party supplies from Birthday Express!